As Mister Haze's limo sat outside the mall, hoping to catch the Boyce girl as she left, he decided to make sure she was there at all, and to make sure the call from the phone booth wasn't perhaps another family member. Haze let down his window just a smidge, and stuck his hand out the window, letting the top segment of his ring finger dissolve into a small clump of purple bugs. Mister Haze reclined in his seat, his eyes going blank as he entered a sort of trance-like state. The clump of purple bugs flew into the mall, and their eyes were now Haze's eyes. The rest of his body seemed to be out cold, as his consciousness shifted into this group of 30 or 40 bugs that quickly split up to comb the shopping mall for anyone in a Le Veux Poulet waitress outfit. The Reborn roamed the rooftops watching and waiting for...something. Despite feeling that he was ready, he felt something was missing. He had the Power, and he had blades, but he felt he was missing something. Motion in the alley below caught his eye. Four men were threatening a young women with metal rods. He would have been content to watch, or ignore the whole thing, but something, a feeling, rose up from within, from what was left of his soul, deeply buried under cold thoughts. Under his mask, the Reborn blinked. Did he feel pity? Yes...something left from Before--the man he once was wanted to help her. Though he tried, he couldn't fully ignore this feeling. And he did feel like testing his powers on a helpless foe. So he dropped down into the alley, and the thugs turned towards the sound. Before they could see him, the Reborn absorbed the electricity in the area, felt it flow into him, and the lamp nearby died. One of the thugs charged him, metal bar raised, and a bolt of lightening arced to his weapon, and he fell, screaming. The Reborn raised a blade, and watched as electricity danced across its surface. Interesting. He flung it into another's chest, then pulled a rod to his hand, focusing energy into. He watched in interest as a crackling thread of electricity formed from its end, then snapped it, and the third thug dropped. The Reborn toyed with his new weapon, stepped into the moonlight. The fourth thug backed away dropping his weapon and fleeing at the sight of him--A Knight clad in Shadow, wielding a whip of pure electricity. The Reborn laughed. He returned his attention to his new weapon, changed the form of the energy, noting its flexibility. Now it was a shorter thread of energy, with crackling ball of energy at the end--a mace. He nodded. He had his weapon. He released the energy, and the lamp sputtered to life, flaring in brilliance. The woman, who had been cowering on the ground, flinched, covered her eyes. When she looked again, her savior was gone. And throughout the underworld of Norton Peak, word of the Shadow Knight spread. Michael snapped out of his half daze when he heard stirring. He looked inside the room and saw the prisoner awake. Checking on Alexa and Energon he noticed only small beads of sweat. Michael entered the room from and pulled up the other chair. He sat down and stared at his quarry for a bit. But this hood was quite a drawback. He should have taken it off. "I'm Micheal. And you are?" "I'm called Reaper. You're Mimic, right?" Cale grinned slightly beneath his mask. Let them sweat; they didn;t know how much about them he knew. Michael wasn't the least bit surprised by the question. He figured that this guy may have been watching them for an indefinate amount of time. "That's right. Glad you have paid attention. So 'Reaper', mind telling me why you are here?" "I'm a ghost. I wander around, and I haunt things. Guess what; you are definitely haunted." Mimic didn't respond. If anything, it looked like Reaper wasn't getting through to him. Pity. Mimic repeated the question. "Would you believe I'm here to collect the souls of those cursed to an eternity of torment for their crimes?" Cale responed. "How about, I'm here to play practical jokes by haunting random people?" "Maybe I'm here to collect wheat from the grocery store?" Michael chuckled. "It appears that you aren't quite taking me seriously. Since I'm the good guy I obligated to give you this chance. You answer my one question that I have and this doesn't hurt. If you continue down this path of mockery, I can guarantee this will get painful." A brief pause before Reaper answered. "What's your question?" "Who says you're the good guy anyhow? And besides, I sense repetition here." "Okay, fine. I am...was...a normal person. In high school, I was almost always ignored, invisible to people around me. I hit eighteen, and bam, suddenly I find I can go invisible, for real. So I left my ungrateful home, and came here. I was wandering around, when I nearly got hit by one of your buddy's arrows. I followed you, and your friend attacked me, forcing me to fight back, accidentally injuring your other friend, before getting shoved in here." Bloodhawk had finally broken a sweat. He had finally made it back to the diner Le Veux Poulet. Unfortunately, the diner contained nothing needed to help his investigation, other than raw bones of the dead staff. Realizing his mistake of letting the last witness be alone, with the murderer probably out there looking for her, he dashed through the door, running out into the street. Looking around for the quickest form of transportation, he spotted a biker just getting off his bike across the street. Using the opportunity, as soon as the biker entered the store, he flew across the road, and hopped on the bike. Cale made a use of his hijacking skills and reved the engine. Michael smiled. He stod up and exited the room without a word. Walking upstairs he looked for one particular mutant. It didn't take long to find this one. "Ah High Voltage! I think I have need of your special talents downstairs." The flamboyantly dressed mutant turned to Michael and smiled. "Well when you need a bit of a shock I'm the guy to look for!" Michael cracked a fake smile. He hadn't heard that one before. Michael briefed him on the way down. It also helped that High Voltage was slightly sadistic. They both entered the room. Reaper hadn't moved a muscle. "What's wrong too much to handle on your own?" "Frankly I don't believe a word of your story. Your gloves are awfully hightech for someone who wanders the streets. And I don't remember you ever mentioning technopath in your repetoire. So this is the last time I will ask before I am forced to withdraw from the question and hand it over to Sparky there." High Voltage was playing with a spark jumping from finger to finger. This proved problematic, and yet, also kind of useful. He couldn't phase through electricity, but they'd have to open a hole in the field for him to fire. Even so, the hole wouldn't be nearly large enough...but maybe it would be big enough to take out the ones keeping his shield in place. "I am here to observe the situation in Norton Peak." He wasn't lying, Cale reflected. "It won't go well for you if you stand in my way." He still wasn't lying. "Aww come on! You only said one question." "I altered my plans. Pray I don't alter it further. ((I had to.)) Tell me who is your employer. It's really not that hard to do." "Not quite." Michael nodded to Energon and Alexa who opened a small hole in the force field. High Voltage shot as big as a bolt through as he could. Michael halted him as the electricity coursed through Reaper's body. His gauntlets sparked as the electricity went through them. Reaper grunted. "I'm really sorry. I need as much as you know about your employer. I don't want to make this too messy." "Your funeral. I mean that. All I know is a title. They call the leader Operator or something. That's it. No distinguishing names, markings or titles." Mimic looked at him oddly, as if trying to figure out if he was lying or not. The electrical shock was playing havoc with Cale's body; the pain was only now beginning to die down. Cale only hoped that the electricity didn't do too much damage to the gauntlets. Michael sighed. That seemed to be about as much as they would get from Reaper. He motioned for High Voltage to follow as he closed the door. He addressed Alexa and Energon. "You only have to hold this for a few more minutes. I'm going to go upstairs make a call, then come back down with a telepath who will knock this guy out until we can further decide what to do with him." They both nodded not wanting to break their concentration. Michael and High Voltage headed back upstairs. Michael found a telepath and sent him down. Michael opened his cell and dialed a number. "Gez ((Rev's char for those who don't know))? It's me Michael Shaw. Mimik." "Hey long time no talk!" "Listen Gez, I got a secret leader of some government group. Mind looking it up for me?" "His name is Operator. One of his operatives is named Reaper. And that's pretty much all I know. Think you can help?" Despite Mimik's warnings, the duo did break concentration, just for a little bit. He dematerialized, going both intangible and invisible. He immediately phased an energized hand through both the shield-maker and the energy-maker's chests, rendering them both unconscious. The lightning-bolt one followed, although Cale allowed more pain in that attack, solidifying his hand ever so slightly, smiling darkly as the man crumbled to the floor in agony. He then grabbed the shield-maker, being the closest, slung her over his shoulder, and phased through the walls, moving fast and silently, and keeping his unconscious hostage unseen, until he exited the installation. He made sure to memorize the location, before slinking down into a nearby alley. "Command? This is Reaper. I have one prisoner, but expect some people to do some digging on your operation." "Of course you gave them the information...Very well. We'll send a retrieval team for the captive within the hour; they'll meet you at your base of operations." "Yes. Hurry up, now, Reaper. You've failed too many times already..."
Cale sighed, and began the journey back to his apartment. Gez walked down the various parking rows fumbling in his pockets for the keys to the car sitting in the end space. 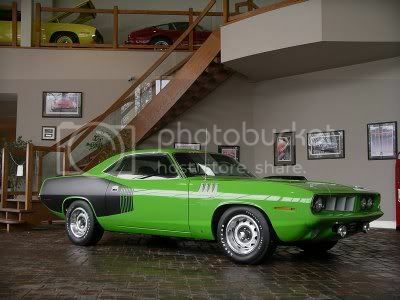 He got in the Cuda and drove it out of the parking complex, spinning the tires as he pulled out on the main road. The loud masculine tone of the engine and exhaust was almost soothing, making the lesser economy sedans look like pansies as he passed them by. The moment was, however, interrupted by the Imperial March ringtone blaring in his tiny ear headset. "Ahck...oww...geez..." Gez reached to his ear and activated the mic. "Hello?...Hey long time no talk!...Sure, what you got?...Yeah, maybe. I have limited access on the uplink, but I'm heading over to the Arca Barracks Armory to pick up some hardware, and can possibly get more data on my computer there. I can check what's allowed but that's it...yeah give me a sec." Gez connected his datapad to the secure satellite uplink pulling numerous files, but the connection stopped, prompting a high level security code. "Err...problem. I have a few things on file, purchase records it looks like...The cost doesn't add up though...Maybe they ordered solid gold desk chairs?...heck I have no idea...I don't have the proper security clearance to get anything else..."
"That's alright. We'll have our techs work on it. For now you might as well come on down here and help us out. Something's up here-"
A commotion was heard from the stairs. The telepath Michael sent down came tearing upstairs. "Michael! He's gone! The prisoner is gone and Alexa and Energon are down. High Voltage is as well and he's hurt bad. He's coughing up blood!" "Hold on Gez, I'll get back to you." He tore off downstairs and observed the carnage. Just as the telepath said. Michael grabbed high voltage and brought him to their medical wing they had set-up. The 'doctor' a mutant who had gotten through medical school before being tested upon himself and being discovered a mutant. He took some readings looking grave. "His lungs are filled with blood. He's not going to make it." Michael swore. This was his fault. He left them alone with a stranger. An now one of them was dead and three others unconscious. Although Speed Freak in a coma wasn't necessarily a bad thing. But still. Reaper had just made an enemy. The Reborn had quickly left the alley, leaping onto an adjacent rooftop at the flash of light and continuing into the darkness. He planned on returning to his meditation chamber until the following night, but stopped when he heard someone speaking in the middle of a dark alley. "You mean the apartment." The figure listened for a second, then sighed, and continued on, carrying a figure over his shoulder. The Reborn followed "Reaper", thinking. This was clearly something more than a casual conversation--this Reaper was up to something. He focused on the figure, managing to glean a few basic thoughts, mostly frustration with his superiors, but mainly focused on his motivation--darkness greeted his probes, and The Reborn made a decision. He waited until Reaper neared a lightpost, then drained the power and dropped down infront of him, a ball of energy in his hand. Reaper, as well as his captive, immediately disappeared, and the Reborn lashed out with the energy, telekinesis, and a uncontrolled mental blast. The Reaper and his captive crashed into a wall, stunned. The Reborn fed energy into his weapon, creating a mace. "Who...are..you?" he hissed, focusing his mind on Reaper, keeping him from disappearing again. Reaper grunted. His invisibility was having difficulties here. This guy was obviously a telepath. Luckily, though, he had some experience with them before. He began to think of the most random things he could think of, a purple cow, a pen, a five day old puppy, blue sky, and others along with a constant stream of random numbers. The flow of unstructured thoughts was bound to at the very least make concentration upon his mind more difficult for this meta. "I am none of your business." He subtly energized his gauntlets, in case things got dirty. "Get out of my way; I'm busy here." While he answered this strange attacker, he worked on summoning enough mental energy to force himself into invisibility. As soon as the engine came to life, Bloodhawk accelerated the bike and brought it to fifth gear. He zoomed down the middle of the street with his cape flaring menacingly behind him, as he ducked and weaved between cars. The only thought that was going through his head was to save her, because he knew that she was the only witness to the murders, unless if she herself was the killer, in which case he had to apprehend her. Both ways required him to get to her. A few minutes later, he arrived at the shopping mall. However, there was a limousine parked in front of it, which was a strange sight, due to the crime rate of Norton Peak.... ah well, he shrugged, he could worry about it later. He put the machine at the peak of its speed as Cale did a wheelie through the front doors of the shopping mall, the glass instantly shattering around him. He was in no mood for subtlety at this point. The Reborn smiled grimly beneath his mask--"Reaper" was resisting. He was worthy. It wouldn't matter. Random thoughts would make controlling or reading the mind difficult--unfortunately for Reaper, he needed to do neither. He only needed to press hard enough to make him give in, and to keep him from disappearing. He gathered more strength, pouring the untrained, brute power of his mind into Reapers, crushing resistance. Reaper flinched. "Tell me." The Reborn pounded his words into his foes mind. WHO ARE YOU! "Resistance is futile...Reaper." Mister Haze's scout bugs were buzzing quietly through the mall, looking for the Boyce girl. The bugs had spread out, so only 5 or 6 were present when the man in the red cape crashed a motorbike through the main entrance. Mister Haze was relayed this information by his bugs, as their eyes were now his. "Bloodhawk..." mister Haze muttered from his trance in the back seat of his limo. Suddenly, there was a sharp ringing in the limo, snapping Mr. Haze out of his "coma". "Hmm?" Mr. Haze grunted, reahcing for the source of the sound, his phone. "It's...it's me." Came the voice of Burst Limit on the other end of the call. "What's going on? Are the Redeemers making a move?" "Well, yes, but not against you. They got into a fight with someone called Reaper earlier, and now High Voltage is dead, so they're all pretty focused on getting him." "Keep me updated." Mr. Haze said, hanging up. Well at least those blasted Redeemers would be occupied for awhile. Mr.Haze closed his eyes once more and focused on reestablishing his link with his "scouts" in the mall. Keep an eye on the man in the cape He instructed his bugs. If he finds the girl, eat him. But leave the Boyce child alone.